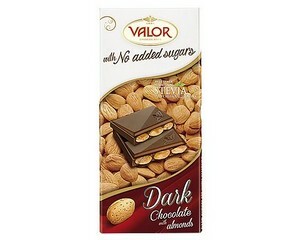 Valor (Sugar Free) Dark Chocolate with Almonds bar is enriched with the aroma and flavour of the finest almonds. 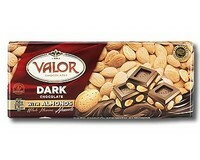 Valor only uses whole almonds of the Marcona variety. A delicious treat. Cocoa solids 52% minimum. Ingredients: Sweetener: maltitol, cocoa mass, almonds (25%), cocoa butter, emulsifier: soya lecithin, sweetener: steviol glycosides (0.02%), flavourings. May contain traces of hazelnuts and milk. Contains naturally occurring sugars. Excessive consumption may produce a laxative effect. The best chocolates, sugar-free or not, I've ever had. 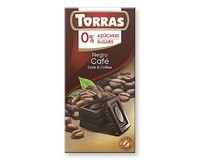 I first tried this in Spain & fell in love with the rich taste of dark chocolate & smoky almonds. Sometimes dark chocolate can be bitter, but this bar isn't at all. It's a real treat for a diabetic like me, and I'm thankful I can find this in the U.K now!